Because of my studies I spend most of the day surrounded by guys (I’m the only girl in my class) and I miss some femininity, that’s why today I felt like bringing it out, wearing these lady like outfit. This isn’t an everyday look, so I decided to wear it today because I didn’t have class and I was going to meet my friends. This look is inspired on the 50’s, I believe the style of those years is super feminine, flattering and shows the curves of your body without being super tight. That’s why Dior is one if my favourite brands. 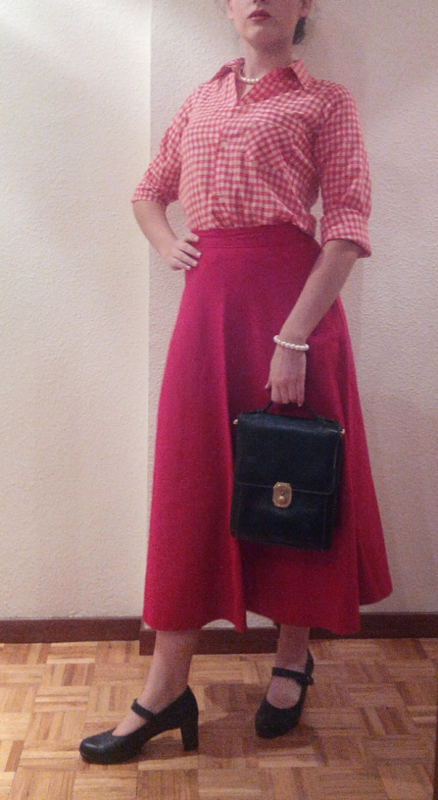 First of all I decided to wear this vintage red midi skirt. Midi skirts are very classic piece of clothing, that’s why I only find them flattering in a bright colour like red. It might be my impression, but if I wear a demi skirt in a dark colour I feel like I’m wearing a grandma skirt. This season gingham print (a kind of square print) is on-trend. So in order to make the look a bit less classical, I decided to wear a red and white gingham shirt. 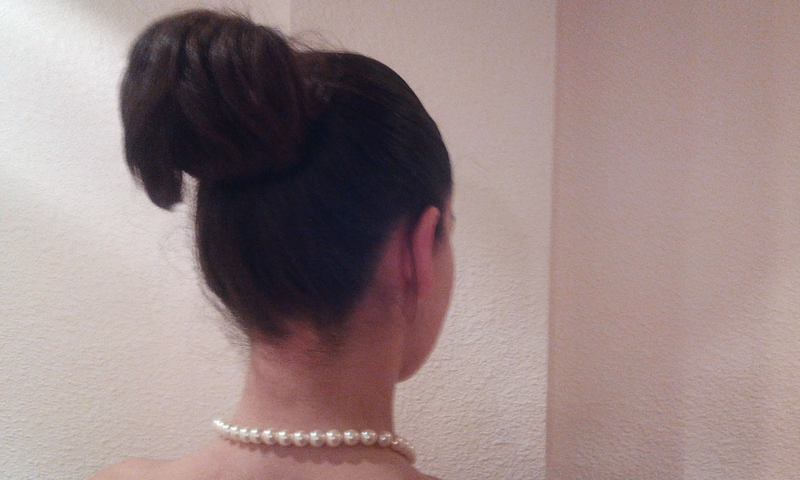 To add a bit of elegance and femininity to the look, I decided to wear a pearl necklace and bracelet. On my feet I decided to wear a pair of black leather heels. I’m the kind of person who doesn’t like wearing heels, but this ones are by far one of the most comfortable I’ve ever wear. Although they are quite high, the heel isn’t very thin and they have a strap so it’s quite easy to walk with them. The heel is made out of rubber and it has a little platform on the front, so they are more comfortable than average heels. To mach the heels I decided to wear a black vintage leather purse. 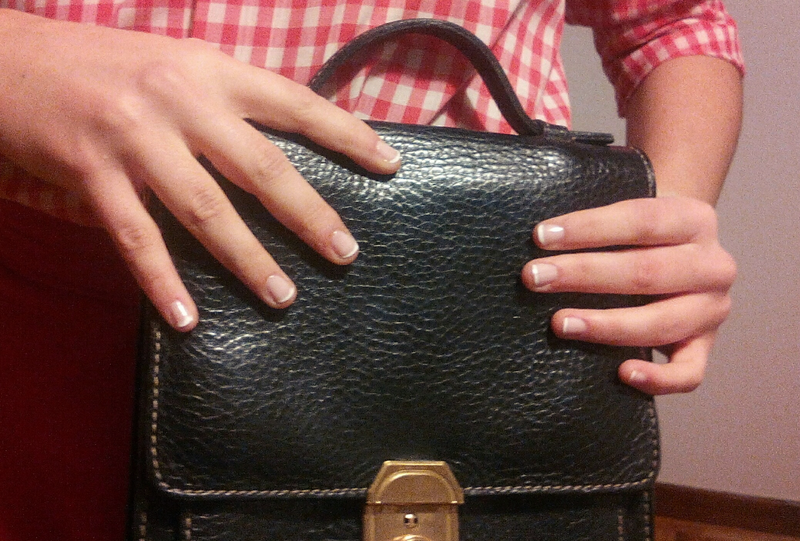 Since I had time, I decided to wear a French manicure in my nails, as you can see in the previous picture. I believe this is the most elegant nail style, it’s quite easy to achieve and it lasts for a long time. Finally I decided to make an easy but feminine hair style. I recently got my hair cut, so I’ve been trying new hair styles and I really love this one. You just take a high ponytail and put the hair tips inside, grabbing them with the hair elastic. You can leave a bit a hair outside in order to tie it around the hair elastic to hide it, and voilà, you have an elegant and easy bun. Did you like this look? What kind of look to you like to wear when you want to feel a bit more feminine? Pearls are perfect with the red and white gingham shirt. What a match! Really nice. Don’t be bashful, the photos have much more impact if the face is visible. Gorgeous! Love dressing up “pretty” when I get the chance. Mostly I am in my garden or kitchen :). I love this look so much! You definitely rock it well. Though that’s an adorably classy look! good content material as you did, the internet will be a lot more useful than ever before. subject, it may not be a taboo matter but generally folks don’t discuss these topics. Thanks again for considering readers like me, and I wish you the best. I like your work, thank you for sharing all the beneficial blog posts.